Let’s keep this short and sweet, as Easter is just a couple of days away. The classic Easter meal usually features one of two meats, Lamb or Ham. Luckily each of these options has one wine that pairs perfectly with it practically regardless of how it is prepared. Ham and Pinot – A typical glazed Easter ham has both sweet and savory flavors, along with a touch of salt. So the idea is to match it up with a wine that has high acidity, low tannins and lots of fruit. So a lighter Zin, Rhone or Chianti could work, but West Coast Pinots are really the way to go. Seaglass from Santa Barbara is a great value option and Nielson (by Byron) from the Santa Maria Valley is a little heartier and will cost a few bucks more, but it is full of expressive cherry, raspberry and peppery spice goodness. However if you can get your hands on some juice from the mad genius Rick Moshin from his extensive and ecletic line of Russian River Valley Moshin Pinots, then you are in for truly a heavenly Easter meal. Don’t like Reds? Then Riesling will probably be the best pairing option. You know how apple, apricot, and pineapple are ideal partners for ham? Well, the same goes for the wine. The apple and tropical flavors contrast perfectly to a salty ham while the bright acidity and light style keep the sweetness levels in check. Wilim Riesling from Alsace is bone dry and an ideal option, especially for around $15. But if you like a hint of sweetness and more body you may want to go with a Spatlese from Mosel. However my favorite white pairing is the Eroica Riesling from Columbia Valley, Washington. Chateau Ste. Michelle and Dr. Loosen partnered up to create this beauty and for around $20 I dare you to find a more luscious, balanced and yummy Riesling anywhere. 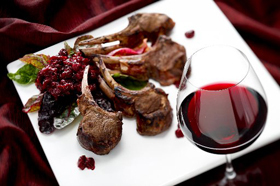 Lamb and Cab – Lamb is full of flavor, fat and if it is grilled will have some smoky character too. You need a big boned, tannic wine to stand up to a meat like that. If you are grilling it, the Bordeaux route is preferable as the terroir driven nature of those wines accentuate that grilled, smoky flavor. My favorite value Bordeaux right now is Chateau St. Barbe 2011 as it is a big wine with loads of minerality and a fruit filled, long, dry finish. Best under $20 Bordeaux out there, hands down. Chateau Talbot offers a lovely, classic Bordeaux experience, but will be at least double the Barbe price. California Cabs will work just as well, particularly if you have a thicker cut and are roasting the lamb. McMannis offers a solid value Cab for under $15 and the new vintage of Twenty Rows 2012 Napa Cab is surprisingly stellar for around $20, as I have not been a fan of past vintages. But the ’12 Peju Napa Cab is off the hook delicious with oodles of big, dark fruit, vanilla and spice. It ain’t cheap at around $50, but it is certainly guaranteed to please your entire Easter crew.